I have so much to catch up on here on Country Mouse Tales! If you follow me on Instagram (@countrymousetales) you know that we spent the last four days in Florida! It was an amazing way to end 2012 and to start 2013, and of course I have an obscene amount of pictures to share - those will be here later this week or next (I keep forgetting that it is already Thursday). Every year around this time, I look around our house and think "how the heck do we have SO MUCH CRAP?" This year I have decided to do something about it. I am cleaning house - and I am going to be ruthless. I am such a packrat - I mean, I still have my track spikes from high school - you know...in case I take up sprinting again any time soon, my textbooks from college, and my stamp collection from elementary school. It has to stop! So? Enter 30 Bags in 30 Days. The concept is simple, over the course of 30 days you just tackle one space at a time, and you fill a bag full of all the crap that has taken over. Here is my list - including the progress that I have made so far. I actually started before we left for Florida, because I wanted to make this fit into the month of January. Obviously this list is specific to our house - I just thought about what areas stress me out when I look at them. Also - in the back of my mind - I keep thinking about what a disaster it was when we moved last July. We have decided that we will not be staying in this house when our lease is up (more on that later - there are so many reasons), so I really want to make sure that our next move goes more smoothly than our last! A lot of our stuff (like books, frames, etc) are actually still in boxes in the basement, and I mean really - if it has been in a box for six months, we clearly do not need to keep carting this crap around with us. I am determined to cut down on our crap!! This is the bag from the kitchen - I also filled a box to take to Goodwill. I was surprised to find that I actually cleared out enough space that I had three empty shelves. So tell me? Are you a packrat like me - hiding your clutter in boxes in the basement and behind closed closet doors? Are you going to do anything about this year? I love this. Makes me want to make a list of my own and just do it. In fact, I think I'm going to. It will help me keep my mind rolling and make me less cluttered all together. Im glad to help! I know for me to look at it all as one big mess it is just too overwhelming. So far breaking it down into little spaces is helping!! If you do decide to do it (or something similar) I love to know how it goes! i started this last year...i think i did 4 bag in 4 days...fail, but i loved it! I should really do this. We are going to be moving within the next year, and we just have so much crap upon crap! I love this idea!! I. In the process of decluttering our house. It's gotten out of control. I love this concept, and will be stealing it for sure. Thanks!! This is such a genius idea! It breaks it down and makes it manageable! I love it- totally going to be joining in. If not now- very soon! Thanks for the inspiration! This is great. My one word to focus on in 2013 is simplify! This would be a good way to do it! I definitely need to work on de-cluttering and getting rid of all the junk we don't ever use or have space for too! It's a new year and time for a fresh new start! yeah Remember I just filled a 30 foot DUMPSTER! 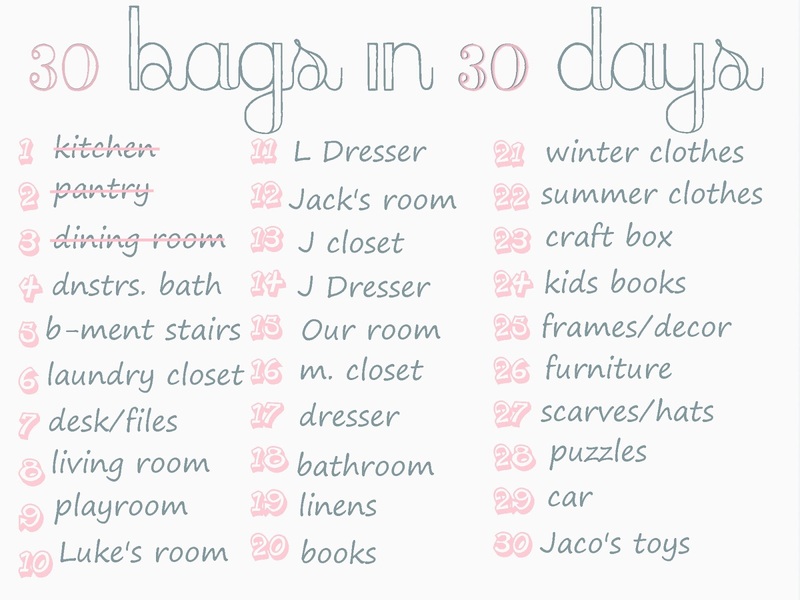 I am new here, and love the idea of 30 bags in 30 days, but there is no way I could come up with 30 bags of things in my apartment, my apartment wouldn't hold the 30 bags :-) I am definitely in purge mode at the moment and making plans to improve areas around the home. I finished cleaning out the kitchen cabinets and began work on the cabinet that also serves as my pantry yesterday. I love this! I could do this as well, I purge every now and then but I need to do a deep purging. Heck, when I was going through my craft closet last week I came across a few boxes that haven't been opened/used since we packed them for our first military move... eight years ago! Such a great idea you genius! I made my own today and am starting now! !